Click.to is a nifty little utility that allows you to move copied text or graphics to their final destination without needing to do it manually. For example, you can select a street address in an email or text document, and use CTRL-C to copy it to the clipboard. As soon as you do, Click.to pops up and allows you to send it directly to Google Maps--no need to go to your browser, go to maps, and then paste in the text. 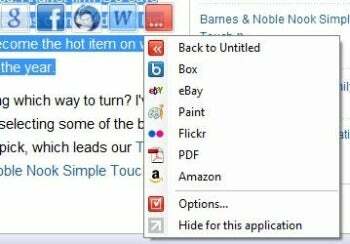 Click.to brings up multiple destinations for your selected text, from pasting it in Word to searching for it on Google. Although Click.to rarely presumes to tell you what to do with what you've copied, it's smart enough not to offer impossible options; you can't send a copied bitmap image to Google Maps or search for it on Amazon, for example. Beyond that, it's got a lot of built-in support for the most common applications and functions, including eBay, Excel, Facebook, spellchecking, and Word. Because Click.to hooks into the standard clipboard routines, there's no need to remember to invoke it using a special key combination—if you "copy," and the data type is something it can handle, it will be there. Click.to offers more possible functions than can conveniently fit on the screen when you copy some data, so only a handful are shown instantly. Click.to calls these "satellites", because they hover above the cursor. The rest of the options are invoked from a drop-down menu that is part of the satellite row. It is trivially easy to change which functions are shown always and which are secondary, via the interface; it doesn't learn your habits. It is also possible to create your own functions for Click.to. If you use a search engine or other Web tool which is not built-in to Click.to's list, you can specify the web site string to use. You can also add links to applications, provided you're familiar with the syntax the application uses to launch itself with associated content as a parameter. This may take some research, as it's not a commonly used aspect of most apps, though it is widely supported. The on-line help takes you through this process, step-by-step, for both "Web Actions" and "Windows Actions". Shortly after this review went to press, the one feature I missed--the ability to automatically append copied text to a document--was added in. It's also important to note that while there are browser tools such as KwiClick or Apture Highlights that offer some similar functionality, Click.to is not a browser plugin, but a Windows tool, so it integrates fully with all of your applications. Click.To quickly sends your copied text to a myriad of applications.